While Prime Minister Hun Sen will lead Cambodia’s official delegation to Tokyo today for a key meeting with international do­nors, one of his fiercest critics will be there uninvited. Sam Rainsy, the outspoken parliamentarian and former fi­nance minister, has gone to Tokyo despite what he called efforts by the Japanese Embassy in Washington to convince him not to go. Speaking by telephone from Paris on Sunday night, Sam Rainsy said while he was in Wash­ington last week he accepted an invitation to meet the Ja­panese ambassador. “They tried to deter me from going. They do not want to hear my point of view in Tokyo,” said Sam Rainsy, who opposes international aid that would support Cambodia’s governing elite, who he views as corrupt and self-serving. “I’ll be loud and make a lot of noise,” he added. 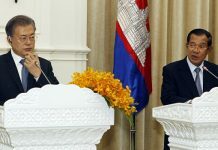 The diplomat said that Sam Rainsy would be free ­to hold press conferences and meet with Japanese parliamentarians. 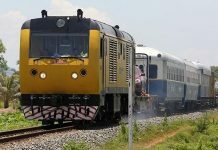 “But he is not part of the official Cambodian delegation and will have to conduct his activities separate from the meeting,” the diplomat said. Accompanying Hun Sen are Foreign Minister Hor Nam Hong, Finance Minister Keat Chhon, Minister of the Council of Ministers Sok An, Minister of Health Hong Sun Huot, Minister of Public Works and Transport Khy Taing Lim, Women’s Affairs Minister Mu Sochua and several other top officials. Additionally, Ambassador to Japan Truong Mealy is a delegate. A charter flight was scheduled to leave Pochentong Airport at 5:15 am today, Hor Sothuon, the Foreign Ministry’s press department director, said Monday night. In addition to attending the Consultative Group meeting, Hun Sen is slated to meet Ja­panese Prime Minister Keizo Obuchi before returning to Phnom Penh on Feb 28. The government is hoping donors will boost aid to Cambo­dia, which was slashed after factional fighting in mid-1997. Sam Rainsy said he will meet members of the Japanese media and parliamentarians and will stay at the same hotel as the meeting participants. “I have evidence to show that the government is continuing to make empty promises and…continuing disruptive policies and bad practices,” Sam Rainsy said. 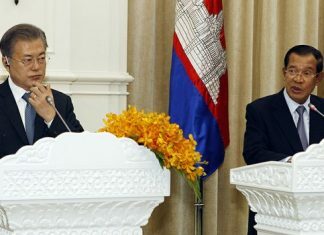 He said he will attempt to ap­peal to the taxpayers of Japan, the single-largest donor to Cambodia and the nation that took the highest profile role in promoting last year’s election. “What is the use of organizing elections and electing a parliament, if the parliament is ignored?,” Sam Rainsy said. He accused the new government of flouting the Constitution by failing to respond to any of eight questions he has formally presented to National Assembly president Prince Norodom Ranariddh. “By bypassing debate between the government and the parliament, by avoiding democratic debate on issues such as economic reform, Hun Sen has showed he hasn’t changed,” Sam Rainsy said.